Flexadrin™ Cream is formulated with Celadrin® to help reduce pain and improve the mobility of soft tissue. It also improves joint flexability and helps prevent long term wear and tear on muscles and joints. In the Flexadrin™ (Celadrin®) cream study, conducted at the University of Connecticut, 100% of the osteoarthritic subjects showed significant improvement in just 30 minutes and cumulative benefits throughout the remaining 30 days of the study. Instantly cools and revitalises tired heavy legs, and sore feet. Prevent long term wear and tear on muscles and joints. Apply 3 – 4 times daily to the affected areas, do not apply to irritated or broken skin, do not bandage. If a rash or irritation develops, stop use. For external use only. 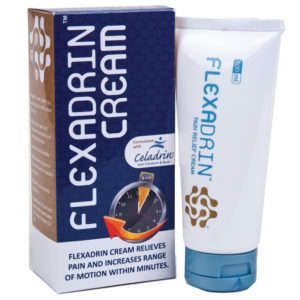 Flexadrin Cream is a fast acting pain relief cream containing Celadrin® which has been medically shown to help the body reduce inflammation and pain.